A hatchery is not a typical building; it is highly specialised with unique requirements for construction and operation. 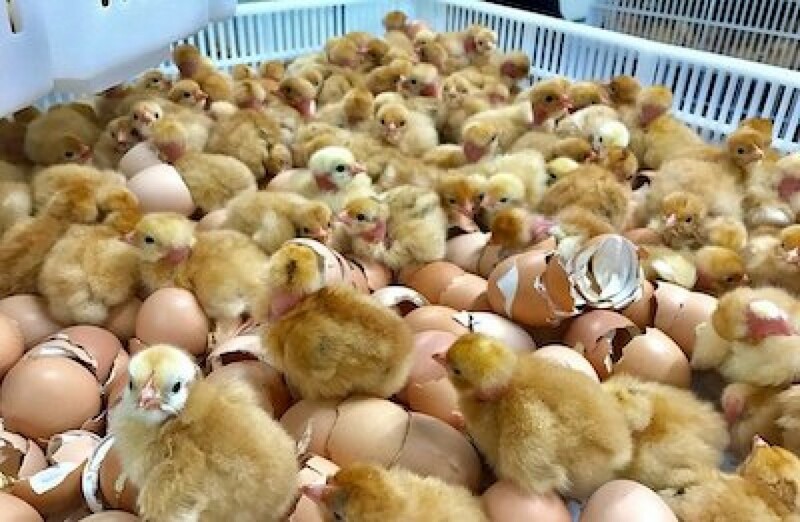 The modern concept of hatchery building is to provide the best physical environment to optimise the efficiency of conversion of a hatching egg into a live and healthy chick through the process of artificial incubation and hatching. The following should be considered for getting optimum fertility and hatchability of eggs. Incubator conditions-Temperature, Humidity, Ventilation and turning of eggs. Eggs should be collected at-least once daily. Commercial hatching eggs may be collected 2-5 times daily to ensure egg quality. Eggs that are free of dirt or debris may be saved. Hatching eggs should not be washed as bacteria can be forced through the porous shell into the egg. Optimum size and normal shape eggs should only be incubated. Large eggs hatch poorly and small eggs produce small chicks. All cracked or double-yolked or thin shelled eggs should not be hatched. Hatchery is one of the greatest areas of disease risk in the whole cycle of poultry production. Proper fumigation is important to kill pathogenic bacteria. Two methods are used to disinfect hatching eggs under field conditions, namely fumigation or dipping in a solution of of detergent or disinfectant. Formaldehyde gas is generated by adding 1.2 ml of formalin to 0.6 g of potassium permanganate for each cubic feet of space in the fumigation chamber. The temperature of 21.1ºC (70ºF) and 70% RH for the duration of 20 minutes time are the optimum conditions for fumigation. Eggs dipping in detergent ,sanitizer or in disinfectants is highly effective in greatly reducing or eliminating the bacteria from the shell when performed correctly. Attention must be given to the temperature of the detergent which must be higher than the egg temperature. The hatching eggs are to be stored at a specific temperature and humidity. The best storage conditions are near 60ºF with 75% humidity. The temperature should not drop below 40ºF. The hatchability of eggs stored for 8 to 10 days remain high with proper storage conditions. Temperature: Incubator temperature should be maintained between 99 and 100ºF. The acceptable range is 97 to 102ºF. The temperature in the hatching unit during the last 3 days should be one degree less than the incubating temperature. Overheating is more critical than under heating. An incubator should be operated in a location free from drafts and direct sunlight. Humidity: Humidity is an important factor for getting better hatchability. The humidity should be maintained carefully to prevent unnecessary moisture loss from the eggs. The relative humidity in the incubator should be 58 to 60% or 85 to 87ºF wet bulb for first 18 days and 65 to 70% or 89 to 90ºF wet bulb reading during the last 3 days. Ventilation: Ventilation is one of the most critical factors inside an incubator. The best hatching results are obtained with normal atmospheric air, which usually contains 21 percent oxygen. Oxygen concentration above or less than 21% affects hatchability. Carbon dioxide concentration should not exceed more than 0.5 per cent inside incubator as higher concentration reduces hatchability and it becomes zero at 5 per cent. Turning of eggs: The turning of eggs prevents adhesion of the embryonic membranes, thereby reducing abnormalities and mal-positions. Proper turning of eggs ensures uniform heating of eggs. Eggs must be turned during most of the incubation period, except for last 3 or 4 days prior to hatching. Assistant Professor, Department of Livestock Production Management, Apollo College of Veterinary Medicine, Jaipur (Rajasthan).